Four Neighborhood Heroes representing first responder groups from cities throughout the region will be honored during pre-race ceremonies on Saturday, August 18 prior to the start of the Bass Pro Shops NRA Night Race at Bristol Motor Speedway. The four honorees - Bristol Police Sgt. Matt Cousins, Tennessee Highway Patrol officer Russell Bernard from Nashville, Chattanooga City Fire Dept. Captain Steve Everett and Knoxville City Police Officer Jay Williams - will be introduced to the crowd at the main trackside stage during pre-race festivities, receive a commemorative plaque and take an official parade lap in a Chevy Silverado truck prior to NASCAR driver introductions, among other planned activities. The four individuals were selected for the honor for going above and beyond the call of duty in their representative communities to make a difference in the lives of others. During the past two weeks BMS officials have traveled to each of the Neighborhood Heroes' respective neighborhoods to make the announcements. "We're blessed to be able to enjoy what we do because of the efforts of our first responders and military who work tirelessly to protect our freedoms," said Jerry Caldwell, executive vice president and general manager at Bristol Motor Speedway. "We can't thank them enough for their efforts and we felt it was appropriate to bring them onto the pre-race stage Saturday night at America's Night Race to allow everyone to honor them for what they do to keep America safe." Each of the BMS Neighborhood Heroes has a compelling story. Bristol PD's Sgt. Cousins was the second officer on the scene the morning of July 7, 2016, when an active shooter opened fire on passing cars near the Days Inn located on Volunteer Parkway in Bristol. Once on the scene, Cousins ordered the gunman to drop his weapon multiple times. The suspect then began firing upon other officers and Cousins was also hit in the leg. Cousins returned fire immediately and seriously wounded the suspect, who continued to fire his weapon as he fell to the ground. One person was killed and another was injured during the incident. Cousins' swift actions brought an immediate resolution to the situation and saved many officers' lives and potentially many more in the community. Last September, THP Officer Bernard was called to the scene of a terrible crash on a local Nashville highway. A large buck deer had been struck by a vehicle and sent flying through the air. Unfortunately the deer landed on another vehicle, smashing through the windshield. As it impacted the car, one of its antlers struck the female driver in the neck. Once on the scene, Trooper Bernard took swift action and applied pressure to the woman's wound until EMT officials arrived. His quick actions saved the woman's life. Chattanooga FD's Captain Everett was off-duty and on his way home from a family gathering earlier this year when he came upon a major house fire in a nearby neighborhood. Captain Everett immediately stopped his vehicle and jumped in to help fight the blaze and assist with the rescue operation. He led the effort, along with assistance from several civilians, to rescue a woman inside the burning home. His quick action saved the woman's life. Knoxville PD Officer Williams was wounded in the shoulder after being shot by one of the TBI's most wanted criminals during a traffic stop earlier this year. He made the decision to hold his return fire at the criminal's vehicle because there was a female passenger inside and Officer Williams wasn't sure of her status. Officer Williams' initial confrontation ultimately led to the criminal's capture by other members of his department along with other local, state and federal law enforcement partners. 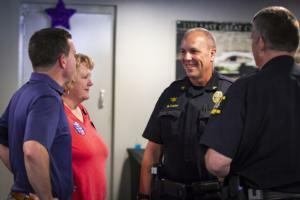 Williams was awarded the Purple Heart by then Knoxville police Chief David Rausch, who said: "Jay is a perfect example of not over-reacting and staying in control even after being shot, which is a testament to his courage and his strength." Williams has also received other awards for his outstanding work, including stopping a string of burglaries in North Knoxville 2016 and assisting an elderly woman in need to food in 2015. BMS' celebration of the Neighborhood Heroes is just one of the highlights you won't want to miss during the incredible weekend. There's so much to do around the grounds of Bristol Motor Speedway, including taking in the Fan Midway, Fan Zone and Kids Zone. There's music, games, food, souvenir haulers, driver appearances, autograph sessions and more. There's great video entertainment provided by Colossus TV, the world's largest center-hung video screen. You'll also want to kick back and enjoy some NASCAR-style tailgating with your friends prior to each night's race. And speaking of fun, on Thursday, one of the biggest and longest running fan fests on the NASCAR circuit kicks off with Food City Family Race Night. There'll be plenty of appearances by drivers, legends and other celebrities during this event, which takes place in the BMS hospitality area and lasts from noon until 6 p.m.
Oh yeah, there's also some pretty good racing planned as well. Four action-packed races are scheduled over three nights during the Bass Pro Shops NRA Night Race weekend, including action in the Whelen Modified Tour, Camping World Truck Series, Xfinity Series and the Monster Energy Cup Series. During the Cup race, you'll get to see all of your favorite drivers doing what they do best, including Bristol dominator and defending winner Kyle Busch, his arch-rival Kyle Larson, rising star Ryan Blaney, 2016 Night Race winner Kevin Harvick, Daytona 500 winner Austin Dillon, defending series champ Martin Truex Jr., second-generation star Chase Elliott, Erik Jones, Brad Keselowski, Denny Hamlin and Bubba Wallace. If you want to bring the entire clan out to experience the amazing fun that is America's Night Race, Bristol Motor Speedway officials are making it easier than ever for families to enjoy the weekend. Kids' tickets (12 and under) are free and adult tickets start at $35 for Thursday's (Aug. 16) UNOH 200 NASCAR Camping World Truck Series race and the Bush's Beans 150 NASCAR Whelen Modified Tour race. On Friday (Aug. 17), kids' tickets are free and adult tickets start at $35 for the Food City 300 NASCAR XFINITY Series race and Pinty's Qualifying. On Saturday (Aug. 18) adult tickets start at $80 for the Bass Pro Shops NRA Night Race and kids' tickets are $10. For all races, each child must have a physical ticket in hand to enter the gates. The Bristol Motor Speedway ticket office is the only authorized location that can produce the free kids' tickets. Tickets can also be purchased for a limited time directly from any neighborhood Food City store. To purchase tickets, please call 423-BRISTOL or buy them online at www.BRISTOLTIX.com. Nominate a Neighborhood Hero for 2019: Have you seen someone who has gone above and beyond in their community and in the line of duty? For 2019, you can get involved in the selection process and nominate individuals for the BMS Neighborhood Heroes program. The 2019 class can include individuals from anywhere since the Bass Pro Shops NRA Night Race attracts guests from all 50 states and more than 20 foreign countries. To access the nomination form, please visit http://www.bristolmotorspeedway.com/neighborhoodhero/.